I was torn about what to make for dinner tonight – Mexican or Pasta? I resolved this dilemma by combining Steak Fajitas and Macaroni & Cheese. This experiment was a huge success! 1. Fill a pot with water for the penne. Once it boils, add salt (to taste) and the penne. Cook according to box directions. Drain pasta and return to pot. 2. As the pasta is cooking, coat a large skillet with 1-2 turns of Extra Virgin Olive Oil. Heat over medium-high heat. 3. Add the sliced flank steak. Cook for 3-4 minutes – just enough to brown the meat. It will cook quickly since it is sliced thin. Remove the cooked steak to a plate. 4. Add the sliced peppers, onions, garlic, and chili powder to skillet. Cook 7-8 minutes, or until desired crispness/softness. At this point, add the steak back to the pan and add the salsa. Mix everything and turn the heat down to medium-low to low. You just want to let the flavors come together. 5. While the peppers and onions are working, melt the butter in a small saucepan. Once melted, add the flour and cook 1-2 minutes. Add the milk and chicken stock. Bring to a bubble and allow to thicken – about 5-7 minutes. Turn off heat and mix in the cheese. Once you have added the cheese, add salt and pepper to taste. 6. Now the fun part – combining all of the elements! Pour the fajita skillet onto the penne. Toss to combine these two parts. 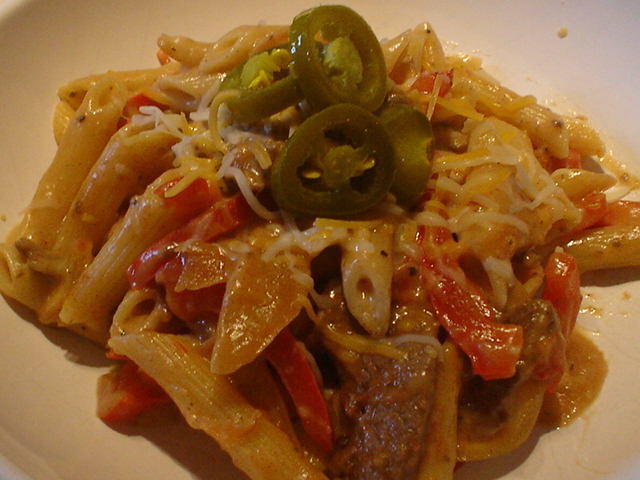 Pour the cheese sauce over the fajita and penne mixture and toss to thoroughly coat. 7. Time to eat! Divide the Fajita Mac-n-Cheese into 4 dishes (or 2 for dinner and 2 containers for tomorrow’s lunch). Top with pickled jalapenos. You could also add some chopped tomatoes, cilantro or additional cheese for garnish. I hope that you try this dish and that you enjoy it as much as I did! Feel free to adjust seasonings and ingredients to your tastes.